Geothermal energy is heat energy stored within the earth, below its surface. The earth, with its large thermal mass, is highly effective at absorbing and storing energy from the sun. As such, the earth can act as an excellent source and sink for heating and cooling buildings. In geothermal (or ‘geoexchange’) systems, energy is exchanged with the earth through a liquid (water or antifreeze solution) travelling in pipes that pass underground, or through a large body of water. This process allows the earth to act as a sink for excess heat energy during the summer, and a source of heat energy during the winter. Ground source heat pumps (GSHPs) are electric powered geoexchange systems that use pumps to transfer heat to and from the earth in order provide building heating, cooling and hot water. These systems are highly efficient, generating three units of energy for every one unit of electrical energy used1. A GSHP consists of three components: the heat pump unit, the liquid heat exchange medium, and the air delivery system. There are two main types of systems – closed and open loop. 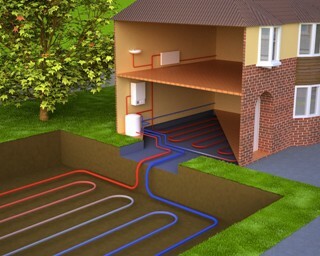 In a closed loop GSHP, heat is exchanged with the earth by a continuous loop of underground piping. An antifreeze solution (or, in a direct exchange systems, a refrigerant) is chilled to several degrees colder than the outside soil. When the solution circulates through the underground piping, it absorbs heat from the surrounding soil. Open systems differ in that they use heat retained in ground or surface water bodies rather than in the soil. As such they are commonly referred to as groundwater heat pumps or surface water heat pumps to differentiate them from closed loop GSHPs. 1 Fortis BC, 2009. Ground Source Heat Pump Program Information.